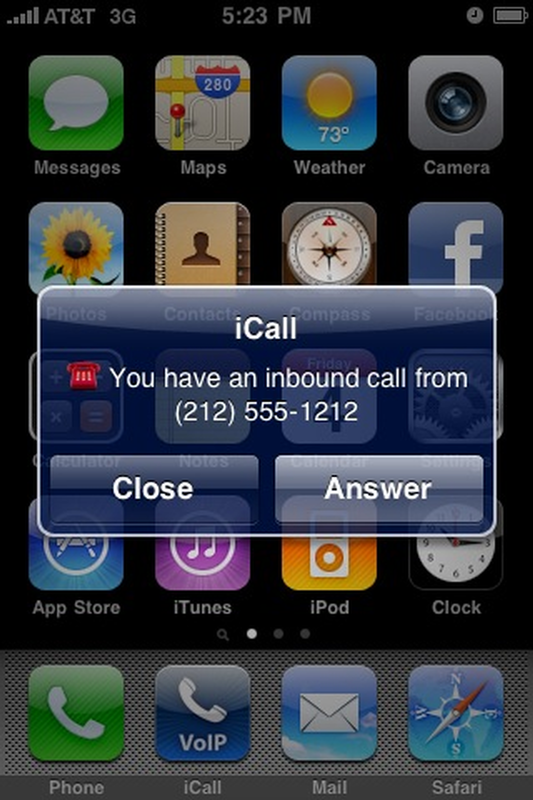 Selected as a New York Times App of the Week, iCall is used by over 4,000,000 people worldwide. iCall is changing the way people around the globe communicate. iCall allows you to make and receive phone calls over 3G and WiFi, even when you don't have a cell signal. Never pay a roaming charge again! More than 4,000,00 users can't be wrong! "An ambitious voice-over-IP app for iPhones and iPod touches, iCall teaches their big competitor Skype a lesson in how to receive phone calls." "In a test, iCall was a breeze to use..."
- FREE ad-supported USA & Canadian calling! - Paid plans and premium features available for power users! Free calling requires free and instant registration to protect against abuse. Premium plans & features require a credit card or an existing iCall Total Access account. Paid calling deposits never expire. Because some mobile network operators may prohibit or restrict the use of Voice over Internet Protocol (VoIP) functionality over their network, such as the use of VoIP telephony over a cellular network, and may also impose additional fees, or other charges in connection with VoIP, You agree to learn and abide by your cellular carrier's network restrictions. iCall will not be held liable for any charges, fees or liability imposed by your carrier for use of VoIP over 3G.